The source files within the template package are encrypted for security purpose. Please, use your transaction IDIYXeQ3p3odasrU6x7AvR to uncompress the archive. Click the “Download” button and download process of your files will start. Once it is done, you will have an archive with your template's files. NB: If you need an invoice for your purchase, you should click the “Download invoice” link on this page in order to get it. If you are unsure whether your server meets these requirements, please contact your hosting provider for additional information. If your hosting provider doesn't support such requirements or you still do not have a hosting provider - we may recommend you to get it with our recommended hosting company Inmotion Hosting, which fully support all requirements of our templates. You can reach them directly by following this link: Inmotion Hosting. Unzip files from your archive: you will see the “site” folder, that contains files that you should upload to your server. Important! Source files are not provided for this product and they are not present in the "source" folder. Open your FTP software and set its file transfer mode to binary. You should use one of the recommended programs: FileZilla, Cyberduck, WinSCP. Upload contents from the “site” folder to your server. Please note that you only have to upload the contents of this folder, not the folder itself. Then visit your website and see the results. To access the control panel, add “/admin” to your site’s URL (example): http://mysitename.com/admin/ and you will see the control panel loading. To launch the Moto CMS control panel you need to add /admin to the URL of your HTML site. For example, your website is located at myhtmlwebsite.com. So to enter your control panel you have to type myhtmlwebsite.com/admin in the address bar of your browser. When you access the Moto CMS control panel for the first time, you will see the application progress bar and a server testing window. A quick setup process will start automatically. If the application fails to download for some reason or you get different errors, please refer to the Typical Errors list. An automatic server test will start during the first run of the Moto CMS control panel. 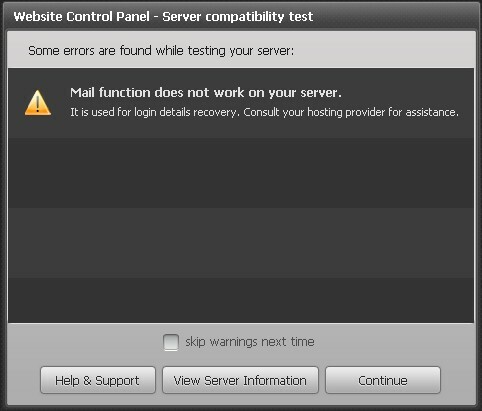 If there are no errors found, you will be guided through the quick system setup process. An automatic server test will check if the server meets all the requirements and if it is compatible with Moto CMS. Normally it checks the PHP version installed, PHP extensions are needed and file permissions set. In a case your server does not meet the requirements specified on the template preview page, you can refer the list of possible errors. PHP version is lower than required. This error occurs if the PHP version doesn't satisfy the requirements. In order to work with Moto CMS you will need PHP 5.4+, 5.5, 5.6, 7.0+, 7.1+, 7.2. If the PHP version installed on the server doesn't correspond to the required one, please contact your hosting provider. PHP extension is not loaded. This error happens in case if some required PHP extensions are not installed. You need the following extensions to work with Moto CMS: spl, dom, reflection, mcrypt, curl, gd, json. These extensions are used by many scripts and in general are turned on by default. If by some reason something is turned off, please contact your hosting provider with a request to turn on all necessary extensions. Maximum upload file size is set lower than required. This error occurs if PHP settings don’t allow uploading files of more than 2 MB. The maximum upload file size is depending on the server's PHP memory settings. Moto CMS itself have absolutely no restrictions for this. Please, contact your hosting provider and ask them if it is possible to increase upload_max_filesize, post_max_size and memory_limit settings to the values you need. 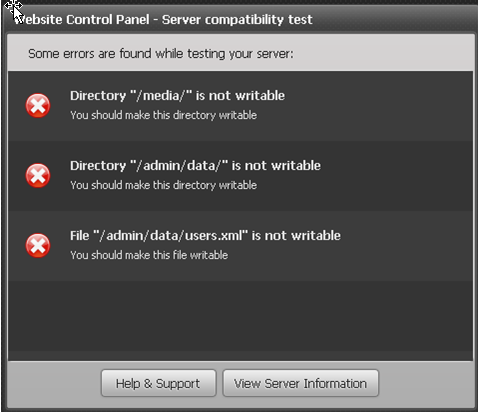 Directory or file is not readable or writeable. Some directories and files should be readable and writeable so that Moto CMS could work properly. If the above permissions will not work, you can try to set 777 (drwxrwxrwx) for directories and .xml files. The "View Server Information" button runs a file that displays all information about your server and the PHP version. So you can easily verify what options are turned on and off. If some adjustments need to be performed on the server, the control panel will display a window with instructions on how to do that. 1. Welcome to the control panel setup. 2. Choose the control panel language. 3. Create a new user account. You should fill in your user name/login, password and your email that is used to retrieve your account information in case you lose it (if you forget your password, please submit your email address for password retrieval). 4. Enter your website's name – it will be displayed in title of all of the pages of your website. 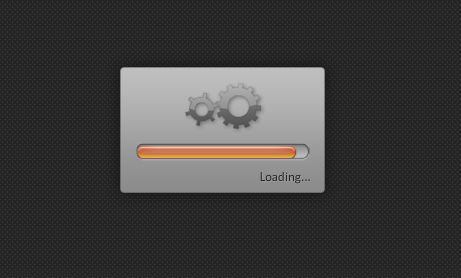 This quick setup process launches only once after you have used Moto CMS control panel. In other cases the system immediately goes to the login stage. NB: The wizard should finish without any errors. If you happen to encounter any, please refer to instructions displayed for further information.